Warm Edge Spacer Market size for 2016 was valued over USD 450 million and is set to exceed an annual installation of 1,500 million meters by 2024. Global warm edge spacer market will witness an appreciable growth on account of intensifying government measures concerning towards ultra violet radiations, environmental degradation, and thermal performance of buildings. The EPA supported Energy Star Program in the U.S. requires Insulated Glass (IG) manufacturers to incorporate true insulating spacer technologies and low-E coatings for achieving minimum performance and durability criteria. Ability to offer reduction in heat loss, noise insulation, and minimized condensation will further exemplify the product’s competency across the fenestration industry. Growing inclination toward energy conservation along with rapid urbanization & industrialization will augment the warm edge spacer market size. Adoption of warm edge technology in the buildings ensure reduced energy losses and high thermal insulation while resulting in lower heating bills. The industry growth is further fuelled by rising energy prices and growing customer affinity toward thermally efficient products. 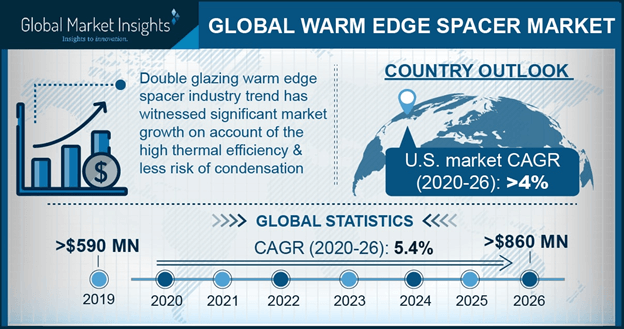 Stringent regulations to curb carbon footprints coupled with strengthening demand for energy efficient windows will propel the warm edge spacer market growth. According to the American Council for an Energy Efficient Economy (ACEEE), the installation of sustainable fenestration systems across commercial building structures could save up to USD 60 billion and reduce over one percent of the U.S. energy consumption by 2030. Flexible warm edge spacer market is predicted to witness growth on account of its optimum thermal insulation and operational feasibility. Ability to offer considerably higher strength, enhanced durability and improved thermal performance will validate the product’s supremacy over the conventional counterparts. Furthermore, these products are composed of non-metal, structural foam which are designed to provide reduced sealant stress, enhanced U-Value, and warmer sightline. Stainless steel warm edge spacer market is projected to exceed an annual installation of over 500 million meters by 2024. These spacers offer significant gas retention, improved longevity, flexible manufacturing and better expansion properties which in turn lower the energy consumption from a building structure. Residential warm edge spacer market size is anticipated to witness growth over 7 % by 2024.The demand across the sector is primarily attributed to rising urban population, burgeoning construction sector and growing concerns toward energy conservation. Stringent regulatory regime across the EU to achieve zero emission building targets by 2020 will further complement the industry outlook. Rigorous building energy efficiency norms coupled with growing penetration of service sector will uplift the demand for the commercially deployed spacer technologies. Ongoing construction activities to refurbish old commercial building structures will further play an instrumental role in stimulating the product demand. 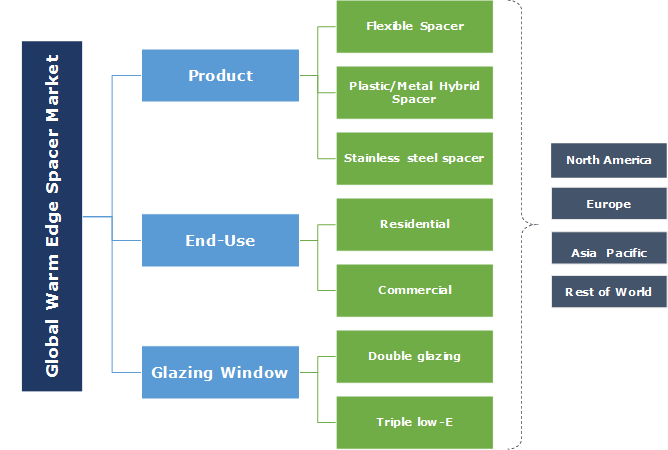 Double glazing warm edge spacer market is predicted to grow over 5% by 2024. Increasing adoption of double glazing windows can be largely attributed to their easy installation and affordable price index viable for residential applications. Deployment of these spacers in the existing and new windows can improve their noise insulation, overall U-value, and thermal performance. Triple low-E warm edge spacers are designed to provide better sound-proofing and minimized condensation on the glass coupled with significantly higher reduction in energy losses. The UK government is dynamically endeavouring to ensure zero carbon buildings with the prevalent deployment of triple glazed windows in the new dwellings across the nation. The U.S. warm edge spacer market size is predicted to reach over USD 200 million by 2024. stringent energy regulations from state & federal regulatory bodies to enhance the environmental performance of buildings have necessitated the extensive adoption of these product. According to the U.S. Green Building Council, buildings across the nation accounted for over 30 percent of greenhouse gas emissions.in 2017. UK warm edge spacer market share is anticipated to grow over 4% by 2024. Introduction of rigid national carbon reduction targets & energy efficiency codes have corresponded to a significant upsurge in the business. The UK Building Regulations outlining the standards for thermal efficiency for all new and replacement windows will significantly augment the industry growth. Strengthening demand for the development of sustainable & thermally efficient building structures will stimulate the Australia warm edge spacer market. The government of Australia has set up National Fenestration Rating Council (AFRC) for allowing consumers to select & deploy optimum fenestration products that conform to the desired performance specifications. Noticeable warm edge spacer market participants include Swisspacer, Ensinger, Technoform Glass Insulation, Alu-Pro, Allmetal, Cardinal Glass Industries, Edgetech (Quanex), Viracon, Saint Best Group, AGC Glass, Thermoseal and others. Price affordability, regulatory conformance, product differentiation, and distribution network are some of the key strategic assets for an industry stakeholder to secure a competitive position in the business. Warm edge spacer is an energy conservation solution, where a low conductivity material is employed to separate sheets of glass in a sealed glazing unit. The drying agent is a bad conductor of heat and is applied between two sheets of glass, thereby restricting the heat loss. Regions with sub-zero temperature predominantly deploy these spacers as an effective means to reduce the heat loss through windows which in turn translates into lower energy bills.